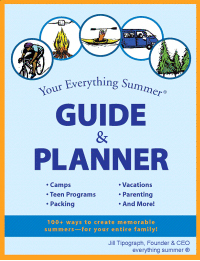 Many parents seek our expertise at Everything Summer to identify the summer camps and/or programs that will will allow their children and teens to be successful. However, setting up a summer that maximizes the possibility of success extends well beyond the camp or program selection process. Even after you’ve identified options that can provide the right environment and secured a space for your student, there are important steps you can take to prepare both the child/teen and chosen program for the summer ahead. It is important that camp and program families recognize that in order to optimize a summer experience, they must give the program the tools to be successful. In the lead-up to the summer ahead – or ideally while researching and vetting programs for fit – you should describe your child/teen and any challenges they have. If your kid has a temper, they struggle in group settings, or they’re simply a very picky eater, being totally transparent up front will give camps and programs the opportunity to proactively look for ways to support them. Many camps or programs will include a camper/student profile form, and we always recommend parents be as transparent as possible when answering these questions (for our clients, we review ahead the critical points we shared to evaluate right-fit, to ensure the camp/program is well aware as start dates become closer). Some parents may prefer to have a conversation instead of filling out a written form – if it’s okay with the program, this is an alternative; however, in any case it is vital to be totally transparent so the camp/program has a sense of what to expect (and prepare for). Of course, this is particularly true if your child/teen’s needs are more acute or if they have a diagnosis. Some parents think they are “protecting” their child by withholding some of their challenges – but by and large, all they are doing is making it harder for the camp or program to provide the needed support. If your child has made great strides you should absolutely note that – and you should make sure the program knows you’re being completely transparent and there aren’t other (new) lurking issues to be worried about – but it’s always better to tell the whole story upfront. In this same vein, it can be helpful to discuss with the camp or program what tools have worked well in the past, so that they can have those on-hand. If your child works with a professional such as a therapist or psychiatrist, or has a school counselor or teacher who knows them particularly well, encourage the camp or program to speak with them to further discuss successful strategies. Part of this partnership also includes being available during the summer if something comes up. Of course, one of the major perks of summer is the fact that is a well-earned break for many parents, with time to travel and/or spend meaningful time with your partner or friends while the kids are away. But dropping completely off the map for weeks at a time can place a tremendous degree of stress on the camp or program. When working with Everything Summer families, we proactively check in with camps/programs throughout the program and are available for situation management should anything arise. If an issue does arise over the summer, the camp or program will want to be in communication with you, and it can make things very difficult for them if there is no one on the other end of the line. While there is no way to guarantee summer success, there are absolutely steps you can take with the camp or program your child or teen will be attending that can be hugely beneficial. By being transparent and available, you will alleviate the pressure placed on camp, position them to offer the support your child or teen needs, and maximize the opportunity your loved one will have an impactful summer experience. Newer PostCollege Admissions Decisions & Readiness: What About A Gap?